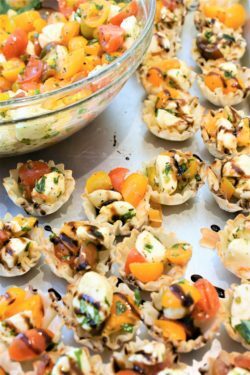 Caprese Salad Phyllo Cups | Recipe For A Party | Life is a Party, So Celebrate! 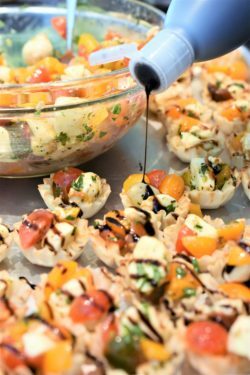 I have served Caprese salad at many parties but serving it this way is a first for me and it was a hit and a perfect appetizer bite to get your party guests excited about the evenings’ menu. 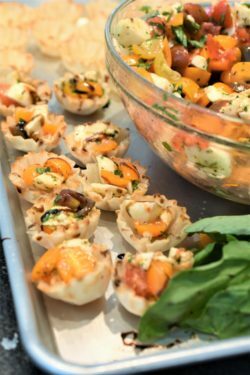 At first I thought that the phyllo cups would get soggy and to my surprise, they did not. 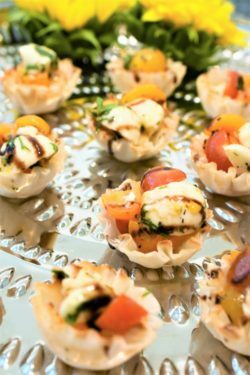 There is nothing better than a bounty of fresh garden tomatoes to really say hello to summer entertaining and this little bite is just what the chef ordered to have with your chilled glass of sangria on a warm summer night listening to music in the background…so keep your freezer full of phyllo cups like I do because there are dozens of uses for them and I have many other recipes on here that showcase this flaky wonder of joy…they will be your best friend for your quick entertaining bites. Paula is scooping this goodness carefully into each cup and yet, so elegantly! Most grocery stores carry balsamic glaze, it’s a must have staple in my fridge for all kinds of recipes…so much faster than making your own. 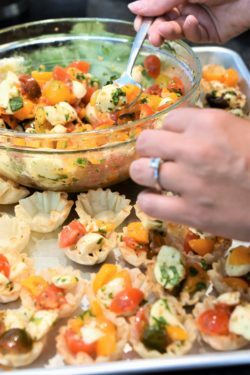 You can make the filling mixture a couple of hours before serving, and fill the phyllo cups just before serving to your guests, but keep in mind that the longer the filling sits, more moisture will come out of the tomatoes and you will have to drain the mixture in a sieve before filling the cups. Hi, I’m Joseph! 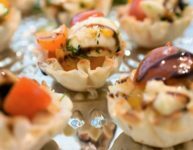 I create simple, delicious recipes for parties that you and your guests will love. Life is a Party, so celebrate!